This week’s Kelowna culinary series continues with Bean Scene Coffee Works, a local roastery and coffee house whose beans rival Vancouver’s best. Owners Deb and John bought The Bean Scene in 2002 and simultaneously dove into the complex world of coffee with a goal to produce espresso and train baristas that could compete at the international level. 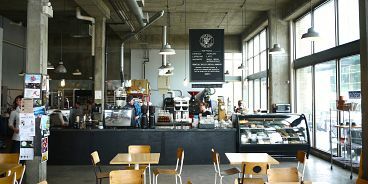 They’ve since fine-tuned every aspect of their business by roasting their own beans on demand in small batches (no computer programming is employed), focusing on latte art (signifying experienced baristas), baking all their treats in-house (with whole ingredients) and replacing their gas afterburner with an eco-friendly mist tank and electrostatic filter (eliminating 1.2 million BTUs per hour from their roasting process). Bean Scene baristas are required to compete in in-house competitions to prove their dedication to their craft and to continue improving their skills. On my visit, this was instantly evident as I witnessed a focused barista pour four perfect espresso beverages. A note to Vancouver cafe owners: if you’re on the hunt for a new and unique roast to add to your menu, consider these guys. Their San Francisco-style flavour would be welcomed by the taste buds of many a big city coffee connoisseur. Owners Deb and Al offer barista training, too.